Aero Adjuster for Windows 7 PC is developed by SamusAranFreak. This is a little app that adds a bit of Windows 8 functionality to Windows 7. 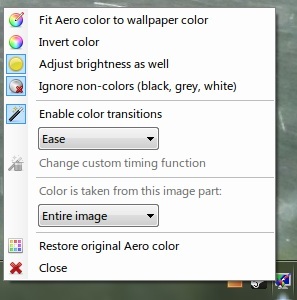 It sits in the tray, automatically detects when you change your wallpaper/when it is changed as part of Win 7’s desktop slideshow, and changes the Aero color to fit that wallpaper. You can always restore the color to the point before the tool was opened. It is an ZIP download, 264 KB in size. Cite this article as: Abhishek Ghosh, "Aero Adjuster : Add Windows 8 functionality to Windows 7," in The Customize Windows, April 22, 2012, April 21, 2019, https://thecustomizewindows.com/2012/04/aero-adjuster-add-windows-8-functionality-to-windows-7/.